Stucco has a long history in the world of wall coatings and provides exterior surfaces with texture, durability and fire resistance. Stucco requires little maintenance, but an alteration such as a texture reduction sometimes requires sanding. Its traditional composition of cement, sand and lime makes stucco difficult to remove; however, special concrete grinding tools make small projects doable. 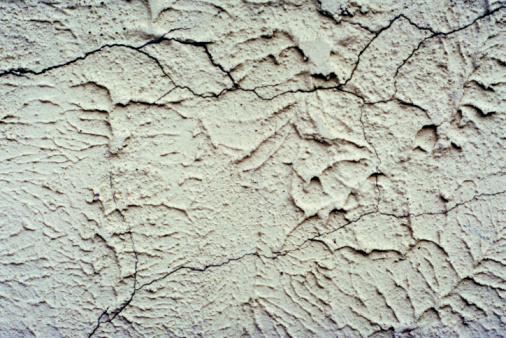 Soften the texture of unsightly stucco. Acquire a handheld concrete surface grinder intended for use on walls. Many hardware stores and equipment rental houses have concrete grinders available for temporary use. Wear a dust mask and safety glasses for protection from the stucco sanding dust. Earplugs and gloves may also be used. Mist the stucco lightly with water to keep down dust. Start at the top of the stucco wall. Turn on the grinder's power and hold the concrete grinding wheel flat against the stucco. Applying moderate pressure, move the grinder slowly, from left to right. Overlap successive passes, working downward. Keep the grinder continuously moving to avoid taking down too much stucco in one spot. Go over the area a second time, now working in an up-and-down motion. Follow the up-and-down motion with diagonal motions. Continue working in the first area, moving in multiple directions, until the texture is sufficiently and consistently reduced. Stop periodically to mist the wall again with water. If working in a poorly ventilated environment, also take time to periodically vacuum the stucco dust. Continue moving to adjacent areas of the wall and work gradually down the wall until finished. If the removal of a stucco coating is necessary, use a smaller angle grinder with a wire wheel attachment to remove any coating still stuck on in hard-to-reach areas.